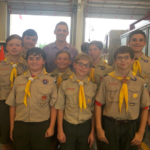 St. Patrick Catholic High School students Jonathan Galle (Class of 2021) and Connor Galle (Class of 2023) recently participated in a unique experience celebrating the men and women who serve in the military and those who have made the ultimate sacrifice for their country. Both are part of Boy Scouts from Ocean Springs Troop 271 and helped with the flag raising in Biloxi. The Nation of Patriots™ Tour takes place on Memorial Day each year, and Harley Davidson Factory in Biloxi hosted the tour this year. Nation of Patriots™ was formed in 2008 and launched the very first Patriot Tour™ in 2009. The organization work son a national level to promote the awareness of and to financially support the physical, emotional, and economic misfortune that wounded veterans and their families are living with today and everyday. 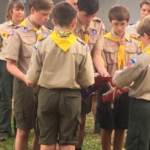 During a brief ceremony, Boy Scouts from Ocean Springs Troop 271 took the flag and raised it up the pole. The tour will make a stop in all 48 contiguous states before finally returning the Harley Factory in Wisconsin on Veterans Day. View the story on WLOX here. 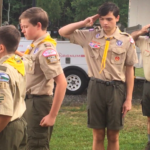 Photos from the flag raising can be found below!